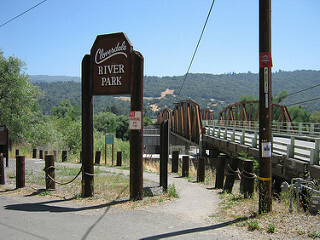 Cloverdale River Park offers access to the Russian River. A relaxed atmosphere, pleasant climate, spectacular scenery, and relatively affordable homes are attracting an increasing number of families and second-home buyers to the once little-known city of Cloverdale. Located in northern Sonoma County near the Mendocino County line, Cloverdale lies about 30 miles north of Santa Rosa on Highway 101. The city of about 9,000 residents incorporated in the 1870s as a stop on the San Francisco and North Pacific Railroad, and its economy was initially based on the citrus farming and logging industries. Although not on the tourism radar as other Wine Country destinations like Healdsburg, Cloverdale is attracting more visitors than ever before, and the proposed SMART train expansion should only increase the city’s profile and accessibility. Local businesses are also booming; according to one of Pacific Union’s top Cloverdale real estate professionals, demand for commercial space is intense in the city’s revitalized and thriving downtown. Fanning out from the intersection of Cloverdale Boulevard and 1st Street, the city’s main business district is home to dozens of locally owned restaurants and shops that cater to tourists and residents alike. Many locals recommend Savvy on First, which dishes up a variety of American comfort food, and the recently opened Trading Post Market & Bakery is already proving to be a hit with its fresh-baked, artisan breads. Just across the street, old-school diner Pick’s Drive-In serves up burgers, hot dogs, and ice cream and has been in operation for almost 100 years. For a community of its size, Cloverdale offers more cultural and entertainment options than one might suspect. Locals can catch first-run and independent flicks at the Clover Theater, whose owners founded the Alexander Valley Film Festival, which had its opening run last year and will screen again in late October. The Cloverdale Performing Arts Center hosts a variety of plays, music performances, and open-mic nights throughout the year. The Cloverdale Arts Alliance sponsors a summer concert series each Friday night from June to early September, which coincides with the city’s farmers market. Those who want to brush up on their Sonoma County history can do so at the Cloverdale History Center and Museum in the historic Gould-Shaw House, an 1862 Gothic Revival Victorian cottage believed to be the first home constructed in the city. Like other Sonoma County communities, Cloverdale enjoys warmer weather than do other parts of the Bay Area, with average daytime temperatures typically reaching the low 90s in summer months and hovering around 60 degrees in the winter. Northern Sonoma County offers no shortage of year-round outdoor activities; besides the region’s ubiquitous wineries, Cloverdale proper has seven city parks, and the scenic Russian River runs just to the community’s east and is accessible from Cloverdale River Park. Less than 10 miles west of Cloverdale is Lake Sonoma, an ideal spot for boating, water skiing, fishing, and swimming. Historic Victorian homes and older bungalows line the city’s downtown section, while suburban tract-style homes are more common on the outskirts. Large custom homes are also being built in the surrounding countryside. According to our real estate professional, Cloverdale has become popular with second-home buyers from Silicon Valley and San Francisco, thanks in part to its relative affordability. According to MLS data, the average median sales price for a single-family home in the city between April 2015 and April 2016 was $445,000, compared with $543,000 in Sonoma County during the same time period. Next PostNext Good News! San Francisco Is in the Dog House!